Milton Friedman used to talk about an interest rate fallacy – that people confuse low interest rates with easy monetary policy. However, I believe that we today are facing an even bigger fallacy – the exchange rate fallacy. The problem is that many commentators, journalists, economists and policy makers think that exchange rate movements in some way are a zero sum game. If one country’s currency weakens then other countries lose competitiveness. In a world with sticky prices and wages that is of course correct in the short-term. However, what is not correct is that monetary easing that leads to currency depreciation hurts other countries. Easing monetary conditions is about increasing domestic demand (or NGDP). In open economies a side effect can be a weakening of the country’s currency. However, any negative impact on other countries can always be counteracted by that country’s central bank. The Federal Reserve determines nominal GDP in the US. The Bank of Mexico determines Mexican NGDP. It is of course correct that strengthening of the Mexican peso against the US dollar can impact Mexican exports to the US, but the Fed can never “overrule” Banxico when it comes to determining NGDP in Mexico. 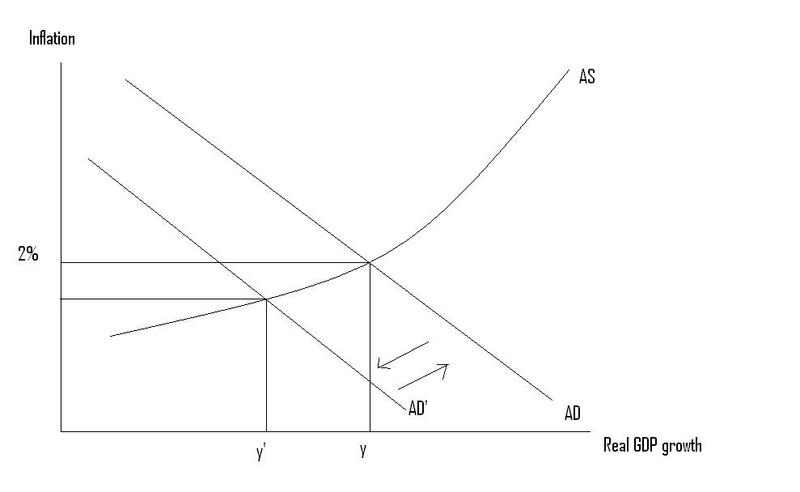 This of course is a variation of the Sumner Critique – that the fiscal multiplier is zero if the central bank directly or indirectly targets aggregate demand (through for example inflation targeting or NGDP level targeting). Similarly the “export multiplier” is zero as the central bank always has the last word when it comes to aggregate demand. For a discussion of the US-Mexican monetary transmission mechanism see here. At the core of the problem is that most people tend to think of economics in paleo-Keynesian terms – or what I earlier have termed national account economics. Luckily not everybody thinks like this. A good example of somebody who is able to understand something other than “national account economics” is former Swiss central banker Philipp Hildebrand. Hildebrand has a great comment on FT.com on why there is “No such thing as a global currency war”. As finance ministers and central bankers make their way to this week’s Group of 20 leading nations meeting in Moscow, some of them may find it impossible to resist the temptation to grab headlines by lamenting a new round of “currency wars”. They should resist, for there is no such thing as a currency war. This is because central banks are simply doing what they are meant to do and what they have always done. They set monetary policy consistent with their domestic mandates. All that has changed since the crisis is that central banks have had to resort to unconventional measures in an effort to revive wounded economies. So true, so true. Central banks are in the business of controlling nominal spending in their own economies to fulfill whatever domestic mandate they have. In the US, for example, the unemployment rate is 2 percentage points above its postwar average. In the UK, output remains 3 per cent below its level at the end of 2007. In both of these countries, the remits given to the central banks make their responsibility clear: to take action to provide economic stimulus. The US Federal Reserve, for example, has responsibility to “promote effectively the goals of maximum employment, stable prices and moderate long-term interest rates”. In the UK, the Bank of England’s main objective is to maintain price stability. But subject to that, it is required to “support the economic policy of Her Majesty’s government, including its objectives for growth and employment”. Japan’s problems are different in nature, and longer in the making. Japanese inflation has been negative, on average, for well over a decade. It is an environment that would not be tolerated in any other developed economy. The recently signalled desire for inflation of 2 per cent is hardly a leap towards monetary unorthodoxy, let alone an act of war. One can sympathise with emerging economies with floating exchange rates, which may feel they are bearing too much of the burden of adjustment. But surely the answer is not for developed economy central banks to turn away from their remits. Rather, it is for emerging economies to focus their own monetary policy on sensible domestic remits, with their exchange rates free to be determined in the market. There is one small and particularly open economy where sustained currency movements were not merely the consequence of conventional or unconventional monetary policy measures but where the central bank opted to influence the exchange rate directly. In September 2011, when I was chairman of the Swiss National Bank, it announced that it would no longer tolerate an exchange rate below 1.20 Swiss francs to the euro – and to enforce that minimum rate it would be prepared to buy foreign currency in unlimited quantities. If Mexico had a problem with US monetary easing then Banxico could simply copy the policies of SNB – and put a floor under USD/MXN. However, I doubt that that will be necessary as Mexican inflation is running slightly above Banxico’s inflation target and the prospects for Mexican growth are quite good. The monetary policy battles that have been fought and continue to be fought in so many economies are domestic ones. They are fights against weak demand, high unemployment and deflationary pressures. A greater danger to the world economy would in fact arise if central banks did not engage in these internal battles. These monetary battles are justified and fully embedded in legal mandates. They are not currency wars. Again Hildebrand is right. In fact I would go much further. What some calls currency war in my view is good news. We are not in a world of high inflation, but in a world of low growth and quasi-deflationary tendencies. The world needs easier monetary policy – so if central banks around the world compete to print more money then this time around it surely would be good news. Dr. Weidmann – monetary easing is not about creating hyperinflation. Monetary depreciation is not about “competitiveness”. What we need is easier monetary policy and if the consequence is weaker currencies so be it. At least the Bank of Japan is now beginning to pull the Japanese economy out of 15 years of deflation. Unfortunately the ECB is doing the opposite. In consequence of the competitive advantage gained by a country’s manufacturers from a depreciation of its currency, any such depreciation is only too likely to meet with recriminations and even retaliation from its competitors. . . . Fears are even expressed that if one country starts depreciation, and others follow suit, there may result “a competitive depreciation” to which no end can be seen. This competitive depreciation is an entirely imaginary danger. The benefit that a country derives from the depreciation of its currency is in the rise of its price level relative to its wage level, and does not depend on its competitive advantage. If other countries depreciate their currencies, its competitive advantage is destroyed, but the advantage of the price level remains both to it and to them. They in turn may carry the depreciation further, and gain a competitive advantage. But this race in depreciation reaches a natural limit when the fall in wages and in the prices of manufactured goods in terms of gold has gone so far in all the countries concerned as to regain the normal relation with the prices of primary products. When that occurs, the depression is over, and industry is everywhere remunerative and fully employed. Any countries that lag behind in the race will suffer from unemployment in their manufacturing industry. But the remedy lies in their own hands; all they have to do is to depreciate their currencies to the extent necessary to make the price level remunerative to their industry. Their tardiness does not benefit their competitors, once these latter are employed up to capacity. Indeed, if the countries that hang back are an important part of the world’s economic system, the result must be to leave the disparity of price levels partly uncorrected, with undesirable consequences to everybody. . .
How much better the world would be had the central bankers of today read Cassel and Hawtrey and studied a bit of monetary history. Hildebrand did, Weidmann did not. PS if the Fed and the BoJ’s recent actions are so terrible that they can be termed a currency war – imagine what would happen if the Fed and the BoJ had decided appreciate the dollar and the yen by lets say 20%. My guess is that we would be sitting on a major sovereign and banking crisis in the euro zone right now. Or maybe everybody has forgot the “reverse currency war” of 2008 when the dollar and the yen strengthened dramatically. Look how well that ended. Jens Weidmann, do you remember the second pillar? Today the ECB is very eager to stress it’s 2% inflation target. However, a couple of years ago the ECB in fact had two targets – the so-called two pillars of monetary policy. The one was the inflation target and the other was a money supply target – the so-called reference value for the growth rate of M3. The second pillar in many ways made a lot of sense – at least as a instrument for monetary analysis. The second pillar was put into the ECB tool box by the Bundesbank which insisted that monetary analysis was as important as a pure inflation target. Read for example former ECB chief economist and Bundesbanker Otmar Issing’s defense of the two-pillar set-up here. If we assume trend real GDP growth (y) is 2% you can calculate the reference value for m that will ensure 2% inflation over the medium term. You of course also have to make an assumption about velocity. ECB used to think that trend growth in v was -0.5 to -1%. Said in another way if the ECB keeps M3 growing at 5% year-in and year-out then inflation should be around 2% in the medium term. An yes, this is of course exactly what Milton Friedman recommend long ago. Today we got the latest M3 numbers for the euro zone. The calvinists should be happy – M3 decelerated sharply to 2.5% y/y in April. Half of what should be the reference growth rate for M3 – and that is ignoring the fact that velocity has collapsed. What does that tells us about the inflationary risks in the euro zone? Well, there are no inflationary risks – there are only deflationary risks. So it is official! Monetary analysis as it used to be conducted in the Bundesbank is telling you that we are going to have deflation in the euro zone in the medium term! And don’t tell me about monetary overhang – the ECB is in the business of letting bygones be bygones (otherwise the ECB would target the NGDP LEVEL or the price LEVEL) and by the way the ECB spend lots of time in 2004-7 to explain why money supply growth overshot the target. Jens Weidmann – monetarist or calvinist? The Bundesbank brought in monetary analysis and a money supply focus to the ECB so I think it is only fair to ask whether Bundesbank chief Jens Weidmann still believe in monetary analysis? If he is true to the strong monetarist traditions at the Bundesbank then he should come out forcefully in favour of monetary easing to ensure M3 growth of at least 5% – in fact it should be much higher as velocity has collapsed, but at least to bring M3 back to 5% would be a start. I hope the Bundesbank will soon refind it’s monetarist traditions…please make Milton Friedman and Karl Brunner proud! PS I of course still want the ECB to introduce a NGDP level target, but less would make me happy – a 5-10% target range for M3 (the range prior to the crisis) and a minimum price on European inflation linked bonds would would clearly be enough to at least avoid collapse. Where D is public debt in euros and NGDP is nominal GDP. Anybody with rudimentary monetarist insights would inform you that D is determined by the fiscal authorities, while NGDP is determined by monetary policy (remember MV=PY). If you want to stabilize or reduce d then you have to either decrease D and/or increase NGDP. So what you basically need is fiscal tightening and monetary easing. Unfortunately Weidmann is basically arguing for reducing NGDP and Hollande is arguing in favour of increasing D. Both positons will lead to an increase in d and hence worsen the crisis. Hence, it would be better if the two gentleman switched jobs – at least mentally. It would be a lot more productivity if Weidmann argued for monetary easing and Hollande argued for fiscal consolidation. That would do the job and the crisis would come to an end fairly fast. Between the need for fiscal tightening and the need for increasing NGDP I have no doubt that it is much more important to increase NGDP. The public debt ratios in Europe has not primarily increased because fiscal policy has been eased, but because NGDP has collapsed. In that sense the crisis is not a debt crisis, but a monetary crisis.